Well, we assumed a whale's heart would be big... but DANG. Notice the ladder in the background. Well, we assumed a whale’s heart would be big… but DANG. Notice the ladder in the background. Ohhhh. It’s THAT big. Ok. Ever see a shark’s egg? You have now. Underwater, held up to the sunlight. You want to be above the storm? How about 37,000 feet above it? If tadpoles had an opposite, it would be the baby swordfish. Remember that rocket that made the news? Here’s the photo. People were freaked out until they knew it was man-made. Eat your heart out Dr. Seuss. Here’s the world’s tallest palm tree. It’s in Columbia’s Corcora valley. This lizard seems to think it is an Armadillo. So they called it an Armadillo Lizard. Rainbows at dusk are really something else! What’s cooler than a regular volcanic erpution? An eruption crossed with a lightning storm. Those aren’t flames. Look closer. Look up and you’ll get an unusual look at the eclipse. This Chameleon is ready to go clubbing. Ever wonder why they didn’t just go around the Great Wall of China? It wasn’t just that simple. If you can see him, it’s probably too late. What are we looking at here? Those waves are what a whole lot of fog looks like. It’s a pretty wild world we live in, isn’t it? Now get out there and enjoy it! Why be average? It’s so overrated. 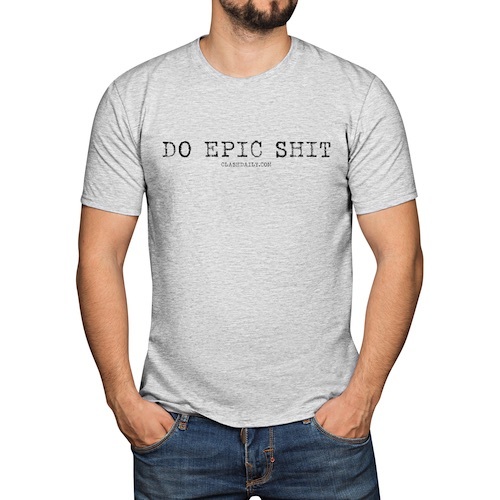 You need to Do Epic Sh-t.